The 2019 Oscar ceremony is going to be a joke for many reasons. No one wants to host the damn thing. The back and forth of how many nominees for Best Original Song are going to perform. The fact that Bohemian Rhapsody is up for Best Picture. And more! But what follows is a list of things that I expected to be certainties. Instead, what I heard on the morning the nominations were televised was nothing but disappointment. Here are a few of those disappointments. Let me start off by saying that I’ve never been much of a fan of Ethan Hawke. Ethan Hawke has also never been nominated for Best Actor in a Leading Role. As soon as the credits started rolling after having witnessed Paul Schrader’s First Reformed (2017), the former sentiment had changed, and it seemed inevitable that the latter would follow suit. The latter will have to wait. Maybe it was out of guilt for not giving Willem Dafoe Best Actor in a Supporting Role for The Florida Project last year, or maybe voters didn’t know quite what to do with what was clearly the finest piece of acting by a male lead performer. But just as Schrader excels in writing Psychomachia (Taxi Driver, 1976, e.g. ), Hawke excelled in becoming the physical manifestation of one’s own mind at war with itself, so much so that the spirit is entwined and salvation becomes something of a cruel joke. Reverend Ernst Toller, the pastor of a small upstate New York church with dwindling attendance, is somehow the role Hawke was born to play. After a career of playing losers, douchebags, outsiders, and cops, all of it erupts into the finest moment of his career: a scream. Without spoiling what leads to this scene, just know that it involves frustration and despair that spans the entirety of the film. And in the final seconds of doing the biggest thing of his life, it all comes crashing down around him. So he takes his cassock off and yells into it. Everything about this moment and what led up to it made it one of the realest things I’d seen all year, where I felt every part of that scream. It was almost like a decades-long career of always being on the fringe, of being the rookie from Training Day (2001) to most viewers, suddenly erupting into something primal. As a man of the cloth consumed by the Silence of God, Hawke is sublime — a quiet man enraged by the apocalyptic end we have brought upon ourselves, haunted by the question, “Will God ever forgive us?,” cracking up with guilt, shame, and the sinful notion of happiness. First Reformed provides Ethan Hawke with a role unlike any he’s ever had because it’s the summation of his entire career; a capstone equivalent to Pepto-Bismol and whiskey. Green Book is winning Best Picture. I can say this with about 95% confidence because of our next snub: Alfonso Cuarón’s Editing nom for Roma. In the past 40 years only two films (Birdman in 2014; Ordinary People in 1980) have ever won Picture without securing at least a nomination for Best Film Editing. And while Cuarón may be the favorite for Cinematography and Directing, his work in the cutting room was equally deserving of recognition. Roma’s tempered pacing allows for bursts of violence (the riot, e.g.) to take us by the throat. We’re disrupted on a visual level that strives to be comparable, in order to elicit sympathy and understanding, to the disturbances felt by the characters on screen. The picture’s beach climax features some of the quickest cuts, as this is when everything, like waves, crash in front of us. Cuarón’s transitions are masterful as they are abrupt. Foregoing the use of dissolves and wipes, he pulls us from setting to setting, only to let us simmer in each individual scene. This contributes to the film’s slow burn, which once again makes the final beach scene such a punch to the solar plexus. But of course the members of the editing branch of the Academy didn’t think this way. They did, however, like the trashpiece of Bohemian Rhapsody. You know what did receive a nomination for editing? Green Book. And now on to the biggest snub since Argo (2012) became the first film since Driving Miss Daisy (1989) to win Best Picture without its director even being nominated: Bradley Cooper for directing his debut feature, A Star is Born. The picture sees Bradley produce, direct, and act, while also co-writing both the script and many of the songs. This may be the fourth iteration of the quintessential Hollywood story (1937, 1954, 1976), but Bradley makes the narrative his own by finding the only person on the planet who could’ve followed the path of Barbra, and that’s Lady Gaga. 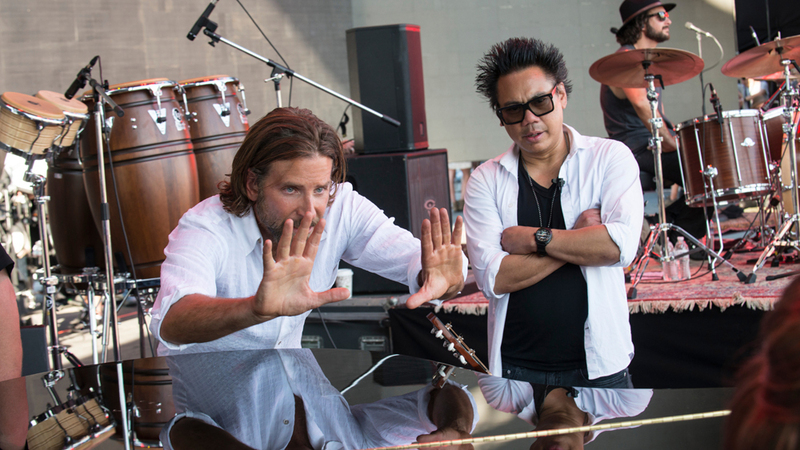 A Star is Born is the perfect vehicle for Stefani and Bradley to assume new roles, to take new chances. For him to try his hand at directing and singing; for her to act in a major motion picture—her previous acting work coming in the form of a Golden Globe-winning performance on American Horror Story: Hotel. The two feed off of each other’s energy and passion and it shows in the film. They need each other in order for the picture to work. While ASIB could’ve fallen flat without a mega-talent like Stefani as the foundation, it’s Bradley direction that lets us see her grow. Character introductions are key, and Bradley understands perfectly how to visually create a character arc. Similar to the Cinéma Vérité rockumentaries of the 60s and 70s, ASIB opens with an electrifying concert performance as Jackson Maine (Cooper) and his band perform “Black Eyes” to a roaring crowd. Quick cuts from the musicians to Jackson’s face to his hands frantically sliding over the strings to the crowd gives the viewer a sense of being there. Especially seeing the film in Dolby or IMAX (I did both), it’s an experience unlike any other you’re bound to find in a theater. Jackson’s voice, his music, is at full volume. He exists to make sure everyone hears him. Ally, on the other hand, has a much quieter beginning. The first shot of Ally is one in which we don’t even see all of her, just her feet as she hides in a bathroom stall at her awful restaurant job, having a hushed phone conversation because she’s the only one in the room. Frustrated, she exits the stall, stands in a black work uniform against a bone white tiled room and screams. Ally is unable to say what she wants to say, how she wants to say it, and actually have someone listen. The first two times we hear her sing, we once again see Ally on the cusp of self-actualization. After taking out the trash at work, she sings a few bars that precede where Judy Garland (Judy was, of course, in the ’54 version of ASIB) began in The Wizard of Oz (1939). Here Bradley imposes the title of the picture in a red font identical to the ’54 version that takes up the entire frame, staging Stefani directly in the middle so as to make no mistake who the star of the show truly is. The second time comes when Ally sings “La vie en rose” at a drag bar the night she meets Jack. In addition to the song belonging to Edith Piaf, it’s the same song that Stefani sang the night that her and Bradley met. In one of the most perfectly composed shots of the picture, Bradley stages Stefani in profile during a conversation about her nose. Evoking the real-life struggles of Barbra and Stefani over having noses that defy traditional beauty standards, Jack traces his finger over the curve of Ally’s nose as everything else goes silent and her nose becomes a work of classical Roman beauty in his eyes. Here the relationship becomes one of adoration; Jack wants Ally to realize just how amazing a talent, and a person, she really is. And for the rest of the film this relationship spirals into eventual tragedy as jealousy, addiction, and mental illness take their toll. Along the way, Bradley maintains a visual-intimacy through consistent use of close-ups. If there’s one close up that’s undeniably perfect, it’s the final shot of the film. And the moments right before it features some of the most emotionally devastating filmmaking I’ve ever seen. SPOILER. Ally loses Jack to suicide and is unable to perform. But after she finds the strength in herself to do so, she puts on a concert in his memory. Like many of Stefani’s songs, “I’ll Never Love Again” brings tears to my eyes; however, 3/4th of the way through the performance, Bradley cuts to Jack and Ally working through the song on their piano—she’s tearing up as he sings to her and the lyrics pick up right where Ally was singing in the present moment of the narrative. The unexpected jump cut to a memory of them together emotionally wrecked me. Not just every time I saw the film in theaters, but every single time I listen to the soundtrack. Right when the memory ends and the song is finished, Bradley cuts right back to Ally with a close up, the camera slightly above her as it tilts down, Ally tilting up. The focus remains on her for barely longer than a beat before cutting to black for the end credits, leaving the viewer stunned. A Star is Born ranks as one of the strongest directorial debuts in American cinema. So how Pawel Pawlikowski became the second director since the expansion to ten Best Picture slots in 2009 to receive a Best Director nomination for a film that wasn’t a Best Picture nominee (Bennett Miller for Foxcatcher in 2015 is the other) is beyond me. The Director’s Guild of America recognized Bradley’s achievement, and their nominations are fairly in line with how the director’s branch works. All I can think of is that Bradley posed a threat. He has the potential to become the next Warren Beatty, and that kind of power is seldom given in Hollywood. One thing is clear: Green Book deserves to win Best Picture because 2018 deserves Green Book. Matthew Germenis has two cats and a cardboard cutout of Leonardo DiCaprio. Though currently finishing an English MA, he spends his time thinking about and watching movies. A film criminally underrated from 2018: Paul Dano’s Wildlife. Follow Matthew for art and cat posts on Instagram; on Twitter for film and MLB thoughts; and on Letterboxd to keep track of every film he’s seen.